It’s now more than a month since the earthquake that laid waste to Port-au-Prince, killing more than 200,000 people and thrusting millions of people into the most desperate conditions. Like many ‘natural disasters’, the earthquake in Haiti may have had a natural cause but what has made it such a disaster was more political and economic than tectonic. Cheaply constructed buildings, a lack of basic services and infrastructure, and a lack of the resources to deal with the aftermath are all the result of a deep poverty which rich countries bear a huge responsibility for. What Haiti Could Really Use are Some New Stories. “Hope for Haiti” Telethon Tonight! The “Hope For Haiti Now: A Global Benefit for Earthquake Relief,” kicks off tonight for a two hour special that includes performances by some of the biggest names in Hollywood. The lineup includes: Ben Affleck, Tim Allen, Jennifer Aniston, David Archuleta, Alec Baldwin, Ellen Barkin, Drew Barrymore, Jack Black, Emily Blunt, Russell Brand, Benjamin Bratt, Pierce Brosnan, Gerard Butler, Chevy Chase, Kristin Chenoweth, Sacha Baron Cohen, Common, Cat Cora, Bradley Cooper, Daniel Craig, Cindy Crawford, Penelope Cruz, Billy Crystal, John Cusack, Eric Dane, Ellen DeGeneres, Fran Drescher, Michael Clarke Duncan, Zac Efron, Jenna Elfman, Colin Farrell, Andy Garcia, Mel Gibson, Tyrese Gibson, Selena Gomez, Neil Patrick Harris, Taraji P. Henson, Dijmon Honsou, Vanessa Hudgens, Randy Jackson, Jimmy Jean-Louis, Dwayne Johnson, Nick Jonas, Kevin Jonas, Joe Jonas, Quincy Jones, Diane Keaton, Michael Keaton, Anna Kendrick, Greg Kinnear, Jane Krakowski, John Krasinksi, Jessica Lange, Taylor Lautner, Daniel Day Lewis, Jared Leto, Justin Long, Rose McGowan, Ewan McGregor, Toby Maguire, Ricky Martin, Katharine McPhee, Debra Messing, Alyssa Milano, Jack Nicholson, Keke Palmer, Holly Robinson Peete, Tyler Perry, Chris Pine, Jeremy Piven, Jeremy Renner, Tim Robbins, Ray Romano, Jeri Ryan, Meg Ryan, Zoe Saldana, Adam Sandler, Nicole Scherzinger, Gabourey Sidibe, Kimora Lee Simmons, Russell Simmons, Christian Slater, Steven Spielberg, Molly Sims, Ringo Starr, Charlize Theron, Ashley Tisdale, Marisa Tomei, Amber Valleta, Sofia Vergara, Mark Wahlberg, Joe Walsh, Sigourney Weaver, Forest Whitaker, Olivia Wilde, Rainn Wilson, Robin Williams, Reese Witherspoon, and Noah Wyle. The foundations that will benefit are Oxfam America, Partners in Health, the Red Cross, UNICEF, United Nations World Food Programme, Yele Haiti Foundation, and the newly formed Clinton Bush Haiti Foundation. The proceeds will be split betweent the organizations funds. The special will be airing on ABC, CBS, NBC, FOX, CNN, BET, The CW, HBO, MTV, VH1, CMT, PBS, TNT, Showtime, COMEDY CENTRAL, Bravo, E! Entertainment, National Geographic Channel, Oxygen, G4, CENTRIC, Current TV, Fuse, MLB Network, EPIX, Palladia, SoapNet, Style, Discovery Health, Planet Green, CNN en Espanol, HBO Latino, and Canadian networks including CBC Television, CTV, Global Television, and MuchMusic. The event will be live streamed online globally across sites including YouTube, Hulu, MySpace, Facebook, Fancast, AOL, MSN.com, Yahoo, Bing.com, BET.com, CNN.com, MTV.com, VH1.com, and Rhapsody and on mobile via Alltel, AT&T, Sprint, Verizon, and FloTV. Earlier we reported a Live from Haiti: Update From Father Rick Frechette on the current situation. Catch up on a report from the front lines of Haiti. The United States is sending more than 4,000 additional troops to quake-devastated Haiti, diverting them from scheduled deployments to Europe and the Middle East , officials said Wednesday. Admiral Michael Mullen, the chairman of the Joint Chiefs of Staff , made the decision to divert the troops “based on continuing urgent needs in the Haiti relief effort,” a statement from the US Second Fleet said. They received the orders on Tuesday. The move to redeploy thousands of troops from the Nassau Amphibious Ready Group and the 24th Marine Expeditionary Unit came as Haitians scrambled for food, water and medical care eight days after a devastating earthquake. The amphibious group left Norfolk, Virginia on Monday for its original deployment but was ordered to proceed to Haiti after taking on more marines in North Carolina. “The marines are in the final stages of embarking onboard the ships. They are expected to leave this evening or early tomorrow morning,” Second Marine Expeditionary Force spokesman Master Sergeant Keith Milks told AFP. If the ships go full speed, they would reach Haiti within 36 to 48 hours, although they will adopt the “most prudent” pace possible depending on weather and mechanical conditions, he added. The move takes the total number of US troops due to be helping out in Haiti in coming days above 15,000. “The ARG/MEU will provide an array of helicopter and amphibious landing craft assets, significantly increasing the ability to quickly provide relief supplies where they are most needed,” the Second Fleet said. 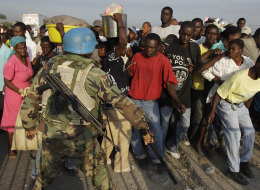 Violence is threatening to boil over in the capital Port-au-Prince as hundreds of thousands of survivors grow increasingly desperate for aid. The 7.0-magnitude quake, which struck on January 12, leveled the capital Port-au-Prince and surrounding towns and villages in western Haiti, killing at least 75,000 people and perhaps as many as 200,000. Three amphibious ships — the USS Nassau, the USS Mesa Verde and the USS Ashland — will support the latest deployment, along with a helicopter squadron, a tiltrotor squadron and medical personnel and facilities. They will bring the total number of US Navy and Military Sealift Command vessels participating in the relief effort to 20. The Nassau has one of the largest ship-borne hospitals after the USNS Mercy and USNS Comfort hospital ships. Eight days after the quake, US military officials leading the relief effort say they are shifting the focus from tracking down survivors buried in the rubble towards recovering bodies and starting to rebuild the devastated nation. Editor’s Note: As much as the U.S. government has touted its love of democracy, the affection often has been conditional, based not on the will of a nation’s population but on the elected leader’s acceptance of American economic and political dictates. 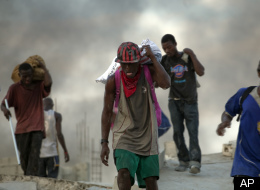 PORT-AU-PRINCE, Haiti — A powerful new earthquake struck Haiti on Wednesday, shaking rubble from damaged buildings and sending screaming people running into the streets only eight days after the country’s capital was devastated by an apocalyptic quake. The magnitude-6.1 temblor was the largest aftershock yet to the Jan. 12 quake. The extent of additional damage or injuries was not immediately clear. The U.S. Geological Survey said the quake was centered about 35 miles (56 kilometers) northwest of Port-au-Prince and was 13.7 miles (22 kilometers) below the surface. Last week’s magnitude-7 quake killed an estimated 200,000 people in Haiti, left 250,000 injured and made 1.5 million homeless, according to the European Union Commission. Still, search-and-rescue teams have emerged from the ruins with some improbable success stories – including the rescue of 69-year-old ardent Roman Catholic who said she prayed constantly during her week under the rubble. Ena Zizi had been at a church meeting at the residence of Haiti’s Roman Catholic archbishop when the Jan. 12 quake struck, trapping her in debris. On Tuesday, she was rescued by a Mexican disaster team.